a more true statement has been written. with what God says above what my flesh instinctively wants. I want to help you realize the difference between urgent things and important things. I want to help you understand how to keep first things first. To begin, I need to make a confession… I am a doer!!! I can’t deny it – I am addicted to doing! #2 the things that I do don’t always turn out right. resulting in more precise execution of the plan. All that said, thinking leads to more precise (efficient and effective) execution. about these statements is, I become what I think about in my heart, or rather, I become what’s in my heart. The things that are in my heart are the things I have thought about or meditated on. priorities out in my life. that part of the lesson now. remember the ultimate? We need to understand the difference between things that are urgent and those that are important. Martha and Mary’s response to the situation. to the immediate things because we have forgotten the ultimate. to be treated like royalty and served an elegant meal fit for a king. The pressure to flawlessly perform that awesome task was intense. That makes for an easy choice huh? 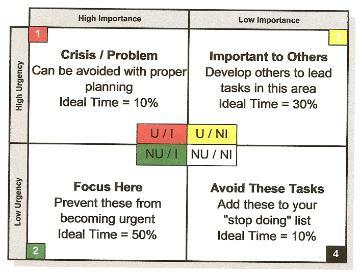 Covey’s time management matrix above. important to others. Notice that the number there is relatively high at 30%. I think that is realistic but not necessarily ideal. I think that’s pretty clear! Tips from Mary and Martha that help us remain at Jesus’ feet? Shaddai, the all sufficient one. order to remain close to Jesus, surround yourself with others who have the same desire.